IMCDb.org: 1985 Volkswagen Golf GTI II [Typ 19E] in "Riff Raff, 1990"
4-light grille could be GTI or driver, but looks as if it's got a red GTI badge next to inner right light. 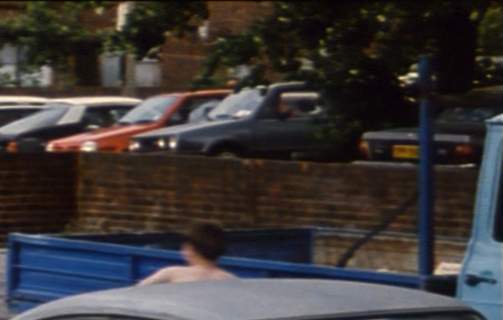 Is that a dark green Cherry coupe with white roof past the red Micra? Wonderful colour scheme! No GTD in the UK as far as I remember. GTD Golf Mk2 not sold in UK, so is GTI. I don't know in UK, but this should be a 1985-87 GTI with that grille...1984 original GTIs had a single light grille until early 1985. Mk2 GTis introduced in UK March 84, 4-light grilles (and incidentally side indicators not visible above) standardised from Aug 85. Presume the 4-light grille was optional from March 84, so this is still a 1984 example? dsl wrote GTD Golf Mk2 not sold in UK, so is GTI. dsl wrote Mk2 GTis introduced in UK March 84, 4-light grilles (and incidentally side indicators not visible above) standardised from Aug 85. Presume the 4-light grille was optional from March 84, so this is still a 1984 example? No listing for any form of Mk2 GTD in Glass's Guide. The only TD is the CL TD (69 BHP) from Jan 85, uprated to 80 BHP Aug 89, and C diesel - normally aspirated to Aug 89, 60 BHP turbo afterwards. Again info checked against Glass's, who state 2 light grille standard until Aug 85, but agree that pretty well all UK Mk2 Gtis were 4 light as I can't recall seeing a 2 light example. Two Mk2 Driver editions listed, both based on 3 door 1.6 CL (1) Apr 87 (2) June 88, now with 4 lights. No mention of mirror position. You shouldn't be too focussed on the grille. It ws a popular extra, available at VW-dealers or aftersales market. The most popular make was KAMEI, but others made them, too. 1991 What Car? magazine and in the price lists it has Golf GTD at £11,896 -it also states "CL Turbo D -replaced by GTD"
quarter lights with mirrors positioned there - therefore it cannot be a Driver.